The new version, which sees a move to a Cloud-based infrastructure and brings improvements to the interface, will arrive via a software update across all current and legacy YouView set-top boxes. The 'next-gen YouView' aims to get you to your content quicker, not only by improving the speed and responsiveness of the service, thanks in part to the adoption of a new HTML5 infrastructure, but also through various new shortcuts on the interface. We’ve always liked YouView. Since the service’s launch in 2012, its dogged bringing together of Freeview TV, on-demand services and PVR functionality under one subscription-free umbrella has provided a flexible and convenient way to enjoy thousands of hours of live, recorded and catch-up programming. For free. We found it possible to like it even more when it started supporting Ultra HD broadcasts and 4K content from Netflix. Now YouView is aiming to improve the user experience. 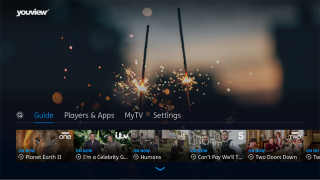 The ‘refresh’ is heralded by YouView's move to a Cloud-based infrastructure, supposedly making it quicker to implement new services and improve integration and consistency across its multiple device platforms. That’s not exactly going to hit users in the face the minute the update has completed, but what will is the improved user interface. While it’s not a radical departure design-wise – the interface more in receipt of a facelift than facial reconstruction – steps have clearly been taken to enhance the user experience. While the full-page EPG remains largely unchanged, the pop-up over-the-top menu that takes up the lower third of the screen is now translucent – i.e. less intrusive. It’s now more visual, with images for every bit of content in the menus, and little touches, such as making the playback bar easier to scroll through and revealing the whole titles of programmes when hovering over them in the guide, helping to make navigation that much simpler. The loading time of BBC iPlayer has also supposedly been reduced - YouView claims from up to 20 seconds to just a few. There are new content shortcuts, too. A new tab in the menu, ‘My TV’ (formerly ‘MyView’), is a shortcut to recorded programmes, and where the brand plans to further improve its content discovery offerings in future. The service currently powers set-top boxes like the Humax DTR-T2000, plus TalkTalk and BT’s TV offerings, and is a feature of Sony's 2015 and 2016 TVs. The roll-out should be coming across the service’s 2.5 million connected devices, the idea being that no boxes (even the very first ones) are left behind. And YouView says customers can rest assured that the update will deliver the new interface without deleting any programmes or settings. The update may not be worthy of the phrase ‘Christmas come early’, but it looks like a step in the right direction for YouView. We look forward to bringing you a full review soon.